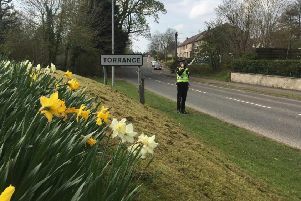 New road signs celebrating two towns’ Fairtrade status have been erected at the main road entrances to Milngavie and Bearsden. The signs, funded by East Dunbartonshire Council and the Fairtrade Foundation, were unveiled recently by members of Bearsden and Milngavie Fairtrade Group. To achieve the status they had to submit evidence to the Fairtrade Foundation to show that many local businesses use and sell Fairtrade goods and that a considerable effort is made by local organisations to promote Fairtrade. A small group of volunteers in both towns spent three years in total putting together an application for the accolade. The group includes local businesses, MSPs Fiona McLeod and Gil Paterson and Milngavie councillors Jim Gibbons and Eric Gotts. The application was based on the number of stores that sell Fairtrade products, the number of cafes that use Fairtrade items and the schools, nurseries, faith groups and other community organisations and businesses that regularly support Fairtrade. It was fully backed by East Dunbartonshire Council, which has promoted Fairtrade since 2004. Sue Milne, one of the founding members of Bearsden and Milngavie Fairtrade Group, said: “We’ve been very fortunate to have had a good number of organisations in the area that support Fairtrade, including The Balmore Coach House which is an excellent supplier of products. “By speaking to people we’ve been able to bring even more people on board. Sue added: “As well as getting a fair price for products the suppliers get a Fairtrade premium to spend in their community. To join the local Fairtrade campaign visit www.facebook.com/bearsdenandmilngaviefairtrade and leave a message.